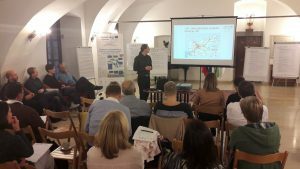 On 12 October 2018, the Regional development Agency of Ljubljana urban region organised a local dissemination event of the Inter-Connect project to present the project objectives, the case studies and the first results to the wide public at a regional/local level. 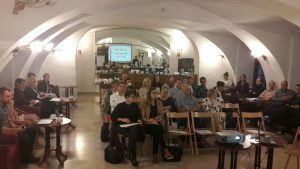 38 professionals from the fields of mobility, regional development, public infrastructure and NGO’s attended the event that was organised in cooperation with SMART-MR project (Sustainable Measures for Achieving Resilient Transportation in Metropolitan Regions). The main goal of the conference was to present Inter-Connect to discuss about the main issues regarding intermodality from Ljubljana urban region to its main transport hubs (Ljubljana Jože Pučnik Airport, Port of Koper). Participants were invited to exchange thoughts and proposals to improve Public transport and intermodality in the context of project activities. The main points highlighted by the participants were that there should be more communication between transport operators, more public transport connections and coverage including outside peak hours and weekends, better connection between Ljubljana airport and its rail transport service, more favorable private vehicle infrastructures.